Delegates from Tamils for Obama accepted an invitation from Assistant Secretary of State for South and Central Asian Affairs Robert Blake and met with him and other State Department officials on February 29, 2012. The delegates discussed matters concerning Tamils in Sri Lanka with Blake and several State Department officials and then handed Blake two copies of Tamils for Obama’s petition for a “Referendum in Sri Lanka to Gain Self-determination for Tamils,” and asked him to hand the second copy to Secretary Clinton. Delegates from Tamils for Obama met with Assistant Secretary of State Robert Blake last February 29, 2012, and discussed matters important to Tamils in Sri Lanka. “We also handed him a copy of our Referendum in Sri Lanka to Gain Self-determination for Tamils,” said a press spokesman for Tamils for Obama, “It is modeled on the one that was recently voted on in southern Sudan, and which led to the creation of the new country of South Sudan. We hope for a similar referendum and result in northeastern Sri Lanka. Blake was accompanied at the meeting by three other State Department officials. “When we handed the petition to Secretary Blake, we commented that it was appropriate in a democracy to get the opinion of the people who will be affected by an official action,” said one of the Tamils for Obama delegates who attended the meeting. “We think that the consent of the people makes any subsequent action more legitimate. 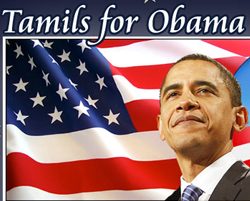 Tamils for Obama is a politically active group of Tamil Americans. We supported Hillary Clinton and then Barack Obama in the Democratic primary and US general election in 2008. We believe that over 70,000 Tamil civilians were massacred during the last weeks of the Sri Lankan civil war. We have watched the behavior of the Sri Lankan Singhalese victors after the war, and we strongly conclude that Tamils in Sri Lanka will only be safe when this unfortunate island is divided into two states. To contact the group, call at (617) 765-4394 and speak to, or leave a message for, the Communication Director, Tamils for Obama. Now we will have the Rajapakses hanged? gas? How much money have we to put in the funds? Gutless characters who post comments under others and posing as Tamils should be ashamed of themselves. Whom are they trying to bluff. At least have the courage to post under your own and not act like a Lion when they are nothing but ‘nariyas’. GG Ponnambalam has the right to express his opinions.I am sure that he is commenting,with his fellow Tamils’ interest at heart.So Gamini don’t get worked up.GG Ponnambalam is a genuine Tamil unlike you. next trap to invest tamil funds who wiil replace RAJA RAJARATNAM? The success of Tamils is not due to their extraordinary capability of lying but the weakness of Sinhalese to counter these lies. So long as they lie successfully the Sinhalese can remain helpless. The decisive fact in this unbalanced conflict is not the outcome of virtues but the success of continuing the process of lying and repulsing this menace. Obama & Hillary will help Tamils until they win election, then they will drag the issue for another 4 years, then they will bring the matter on UNHCR, (the most corrupted Terrorist organization of the UNO)& use Tamils & their money. Do u think I dia will ever allow UNO or USA or EU to decide SL, NOOOOOOOOO, whyyyyyyyyyyy???? They know next step is three Dravidian states in South India will breakaway from the India. After voting for UNHCR vote against SL, Mr MMS has got deeply threatened by the North, that one day he & Sonia are responsible if any up rise in South India due to MMS’s short sighted decision. Gamini is not a Sinhalese, he is a tamil but gives advices as a Lion to us first be to your word. You All Are trying to live a Very Much Luxurious Life with the money collected from Innocent Tamils-Earliar selling the name of Ruthless,Terrorist Prabakaran.Now After elimination of him,they are trying to Earn through an Ealam that will never happen as long as Russia & China have Veto powers at the UN.Secondly,India will never support it knowing that what America wants ultimately is the division of India using Madras Tamilians.For that,Americans want a base in Sri-Lanka.THIS WOULD BE ONLY A DREAM BUT A WAY OF LUXURY LIVING FOR SOME TAMILS,SOME INGOs AND SOME WESTERN POLITICIANS.What they are doing is supporting President Mahinda to get Undue popularity within the Country & he is also cashing on Geneva HR Allegations to rally the masses around him.He Wants These Allegations to be there to be in Power for a long time.On Behalf of him,I am Thanking America,Europian Union & Diaspora for their HELP.